A young supporter of the Standing Rock Sioux Tribe, outside the U.S. District Court in Washington, D.C., on September 6, 2016, where an emergency motion for a temporary restraining order to prevent further destruction of the Tribe’s sacred sites was heard. The Army Corps’ approval of the permit allows the oil company to dig the pipeline under the Missouri River just upstream of the reservation and the Standing Rock Sioux Tribe’s drinking water supply. An oil spill at this site would constitute an existential threat to the Tribe’s culture and way of life. The Standing Rock Sioux Tribe, represented by Earthjustice, filed a lawsuit on July 27, 2016, against the U.S. Army Corps of Engineers for violating the National Historic Preservation Act and other laws, after the agency issued final permits for a massive crude oil pipeline stretching from North Dakota to Illinois. The complaint, filed in federal court in Washington D.C., claimed that the Corps violated multiple environmental and historic preservation statutes, focusing on the decision to reroute the pipeline from Bismarck, North Dakota to the doorstep of the Standing Rock reservation without an adequate environmental analysis and consultation. Despite objections by the Standing Rock Sioux and other organizations, construction of the pipeline began. On Dec. 4, the U.S. Army Corps of Engineers announced that it would not be granting an easement under Lake Oahe for the Dakota Access pipeline to cross the Missouri River a half mile upstream of the Standing Rock Sioux Tribe reservation. The Corps further stated that it plans to prepare an Environmental Impact Statement for alternative routes. These actions triggered a new round of public involvement processes to permit the final piece of the pipeline as required by the National Environmental Policy Act. The decision was major victory for the Standing Rock Sioux Tribe and all who stood in solidarity. On Feb. 8, the new administration granted the Lake Oahe easement, allowing the pipeline to be constructed under the Missouri River half a mile upstream of the Standing Rock Sioux Reservation. It reversed the earlier decision by the Corps to withhold the easement while the agency completed an environmental review of alternate pipeline routes and the Tribe’s treaty rights. The environmental review, referred to as an environmental impact statement, has been wrongfully terminated mid-process. 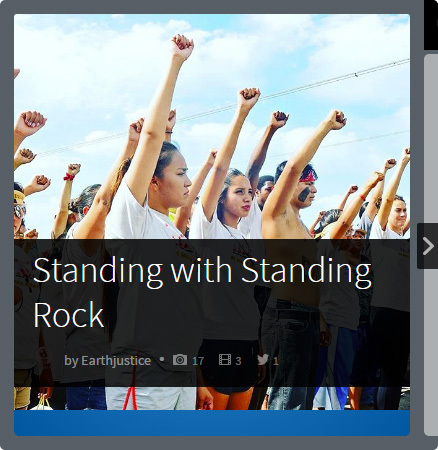 On Feb. 14, on behalf of the Standing Rock Sioux Tribe, Earthjustice filed a motion for summary judgment on the major legal claims in the lawsuit filed against the Corps. The motion for summary judgment asks the judge to rule on major legal questions that have not yet been resolved during this case, including whether National Environmental Policy Act requirements have been met and whether the Corps’ actions violate the tribe’s treaty rights. The judge appears ready to move forward on this case on an expedited basis, which is vital since attorneys for the Dakota Access Pipeline now say construction could be completed much sooner than they originally told the court. On June 14, a federal judge ruled that the federal permits authorizing the pipeline to cross the Missouri River just upstream of the Standing Rock reservation, which were hastily issued by the Trump administration just days after the inauguration, violated the law in certain critical respects. In a 91-page decision, Judge James Boasberg wrote “the Court agrees that [the Corps] did not adequately consider the impacts of an oil spill on fishing rights, hunting rights, or environmental justice, or the degree to which the pipeline’s effects are likely to be highly controversial.” The Court did not determine whether pipeline operations should be shut off and requested additional briefing on the subject and a status conference the following week. In 2010, a single pipeline spill poured 1,000,000 gallons of toxic bitumen crude oil into the Kalamazoo River in Michigan. The cleanup cost over one billion dollars and significant contamination remains. And in January of 2015, more than 50,000 gallons of Bakken crude oil spilled into the Yellowstone River in Montana. It was the second such spill in that area since 2011. The U.S. Army Corps of Engineers issued a brief decision on Aug. 31, 2018, affirming its original decision to issue a construction permit for the Dakota Access Pipeline. Attorney Jan Hasselman explains what it means.